Edited by Ralph S. Palmer. This book excerpt details Falco sparverius; the American Kestrel. Topics include description, subspecies, field identification, voice, habitat, distribution, migration, reproduction, behavior, and food sources. Detailed information is included on phenotypical characteristics and traits of the American Kestrel. John A. Smallwood, Mark F. Causey, David H. Mossop, James R. Klucsarits, Bob Robertson, Sue Robertson, Joey Mason, Michael J. Maurer, Richard J. Melvin, Russell D. Dawson, Gary R. Bortolotti, John W. Parrish Jr, Timothy F. Breen, and Kenneth Boyd. 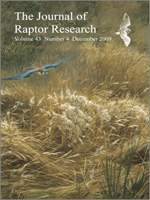 Journal of Raptor Research, 2009. Volume 43, Issue 4, Pages 274-282. This research paper analyzes West Nile Virus (WNV), Cooper’s Hawk population increases, and habitat loss as potential contributors to declining American Kestrel populations in recent decades. WNV is discounted as a primary cause due to the timing of its introduction to North America after the start of documented declines in the studied kestrel populations. Additionally, there was insufficient evidence to support increases in Cooper’s Hawks as a driver for kestrel reductions. Finally, habitat loss within the constraints of the study areas did not validate this as a definitive cause. John A. Smallwood. 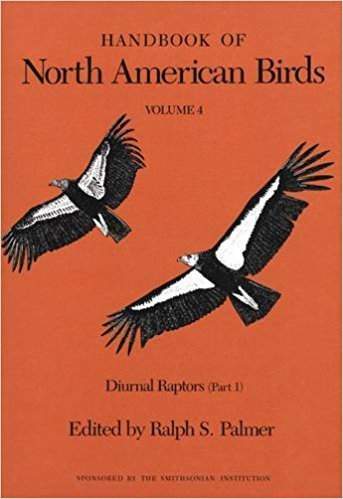 Journal of Raptor Research, 2016. Volume 50, Issue 1, Pages 54-59. Study and analysis is conducted on the impacts of human disturbance to American Kestrel nesting sites in this paper. This observational experiment documented that American Kestrels are highly tolerant to nesting site disturbance, handling, and individual capture and marking by researchers. Erin H. Strasser and Julie A. Heath. Journal of Applied Ecology, 2013. Volume 50, Issue 4, Pages 912–919. Though considered a human-tolerant species, this research study details the negative impacts of close-proximity busy roads and urban development on American Kestrel reproduction. Human induced disturbance and stressors were detrimental to reproductive outcomes in the studied population. Female kestrels nesting near loud, busy roads had higher stress hormone levels and were nearly 10 times more likely to abandon their nest. 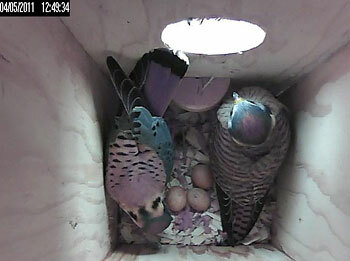 Findings suggest that nest boxes intended for American Kestrels should not be placed close to loud, busy roads. Further, findings implicate that boxes should be monitored consistently to identify when they may be causing harm to a population by decreasing breeding success. Kristen Ruegg, Eric C. Anderson, Kristina L. Paxton, Vanessa Apkenas, Sirena Lao, Rodney Siegel, David F. Desante, Frank Moore, and Thomas B. Smith. Molecular Ecology, 2014. Volume 23, Pages 5726–5739. This paper articulates the use of genome sequencing as a means to more effectively study migratory birds across the annual cycle. Specific genetic markers across migratory test populations were used to reveal population structures spanning North America. The research provides a new methodology to more cost effectively study declining migratory bird species. Methods used in this paper are now being implemented with dozens of other bird species, including the American Kestrel, through the American Kestrel Genoscape Project. Catherine Lindell, Rachael A. Eaton, Philip H. Howard, Steven M. Roels, M.E. Shave. Agriculture, Ecosystems & Environment. 2018. Volume 257, Pages 1–11. This review evaluates the value of preserving and enhancing natural ecosystem services components for pest control in agricultural systems instead of frequently used chemical and/or synthetic solutions. American Kestrels are highlighted as one of many examples where fostering natural predator presence can reduce the use of human implemented pest control solutions with the added benefit of providing for greater consumer value and increasing economic returns.